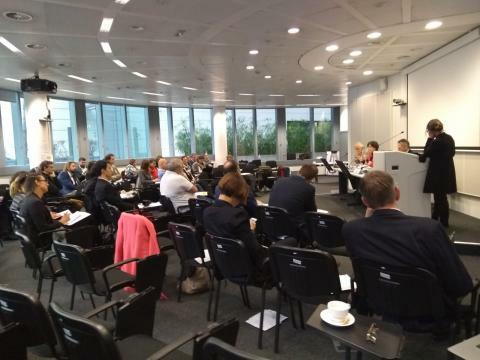 On 27 November 2018, over 50 policy makers and scientists gathered at the Resource Nexus Policy & Cluster Workshop at EASME in Brussels. The Workshop was co-organized by the Executive Agency for SMEs (EASME) and the Horizon2020 projects MAGIC, DAFNE and SIM4NEXUS, and brought together EU-funded projects related to the resource nexus, as well as other (non-EU funded) related initiatives, and EC policy makers with the objective to stimulate peer-to-peer and science-to-policy discussions on how to get the most out of nexus research for the benefit of society and policy-making. Workshop topics include nexus governance, nexus policy coherence, resource efficiency, the nexus in transboundary systems, and nexus research and the Sustainable Development Goals. The workshop counted with the participation of the Sustainable Urbanisation Global Initiative (SUGI) and the SUGI projects CRUNCH, SUNEX, FEW-meter, and Creating Interfaces; Stepping Up, BRIDGE, Next Ag, EU WEF Nexus Regional Dialogues, ITT Nexus FSP, GIZ, IFPRI, Arcadis, and Adelphi. Several EC officers from DG RTD, DG ENV, DG AGRI and DG DEVCO, as well as EASME actively participated in the event.